Replacing a screen door is as basic to a handyman’s skill set as the drill gun is basic to his/her tool chest. Two general types of screen doors are available on the market. The standard light weight screen made of aluminum or wood and the heavy duty screen door that looks somewhat like a security door. The heavy duty door not only looks more secure, it is more secure. It has heavier hardware and if installed properly will add significant security. I would charge 170 dollars including One screendoor one piece with metal rollers standard. I will only install on frames that are in good shape. Any additional work that is needed will be additional. I have a screen door that needs to be replaced. It is 79 x 32 inches. I live near St. Mary’s University. I wanted to make sure you are refering to St. Mary’s in Raleigh, NC. I can do the work you described but need some clarification. Do you want to replace the screen door completely or just replace the screen in the door. Either way I can do the job for 75.00 plus the cost of materials. If you send me you email address I can send you an estimate with the cost and description of materials. How much estimated cost to replace a front screen door that is all glass but the top slides down into a screen with replacement of the frame as well labor cost only? I would charge $150, as long as the frame is in good shape, for a basic install. An example of the door would be larson. I’m in Yakima, WA. How much would it cost to replace the screen on the front door? It’s 72 inches long by 29 inches wide. An Anderson Storm door with built in sliding screen and storm window runs about $125. I would charge approximately $150 depending on the condition of the existing frame and if there is a storm door to remove. 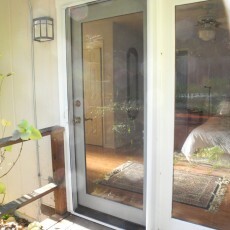 To replace a screen door I charge $15o for labor, as long as the frame is in good condition. That really depends on the size of the door you want to have screened, what kind of screen door you’d like (or a security screen), the kind of mesh you would like (fiberglass vs. metal). The labor itself will depend on the size of the door, between 1-2 hours is a good estimate. We do “freebies” for clients to make them want to spread the word about us. Last job, we did the screen door for free. It was in bad shape but now her landlord has us taking care of all his properties. And so far been back to that same property for more upgrades because he’s so happy with the way it’s starting to come together.